Happy Flash Friday everyone! Flash apparel has been a reoccurring topic on Flash Fridays and today is no different. Today I’m going to share picture with three new Flash items that aren’t released yet, so you have time to save up for them. I do have to admit that I find the timing for some of these to be strange. 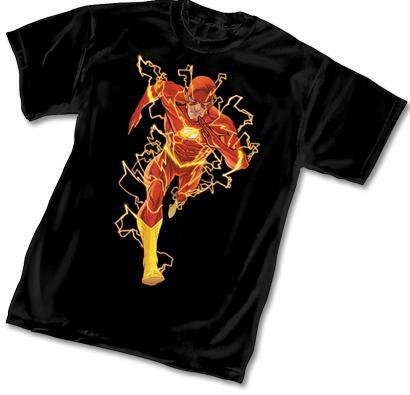 First up is a Barry shirt in his new 52 uniform. If you are a fan of crazy lightning everywhere and thousands of extra lines on costumes, you can now wear it all on a shirt. All joking aside, it is a nice looking shirt. I’ve stated before that I’m just not a very big fan of shirts with the actual character on them. Winter is behind us and before you know it summer will be here. I have an idea, let’s put out a new hoodie. That should sell fantastically in June. I like the design on this one a lot. The offset Flash symbol looks really good. 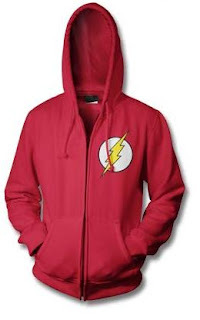 Currently you can get hoodies where the Flash symbol is bisected by the zipper, I think I prefer this. Maybe when October rolls around I’ll think about ordering one. The last item up today is the most fascinating. The wanted shirt features Captain Cold, Captain Boomerang, Weather Wizard, Heatwave, Mirror Master, and the Trickster! I know I just said I don’t like shirts with characters on them, but I’m just excited to see Rogue merchandise. I’m tempted to buy it just in hopes that it sells well enough that the Rogues get even more love. I’m happy that the designs are the pre-52 Rogues, but I find that decision to be a strange one. Huh, I hadn't seen the Rogue one before. 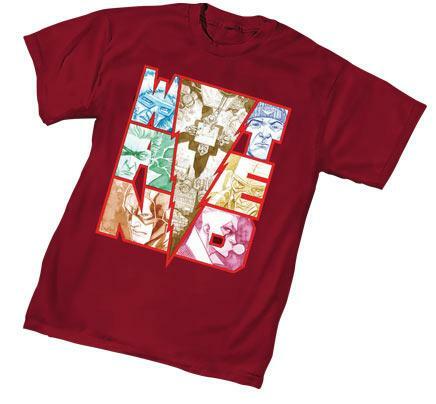 Now there are two Manapul Rogue shirts I have to get. That Flash hoodie has been actually been out for quite a while. I purchased it early last year and I love it because it reminds me of the Flash uniform from the Last Days of Animal Man. Definitely one of my favorites to rock. That Rogues shirt looks excellent. I can't wait to pick it up. Devin, I thought I had seen one similar. Odd that it was listed as "Coming Soon" and not already available.